A new style of healthy food restaurant, inspired by Hawaiin cuisine, has been completed by our office for our existing clients, Columbia Restaurants, in Limassol. 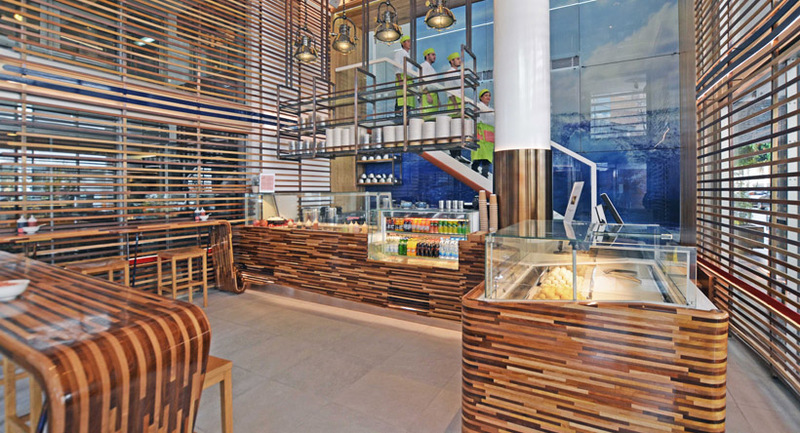 The interior design is driven by one continuous solid wood surface which acts as a ribbon starting as the bar counter and ending as the cover around the display fridges. The back wall of the double height space is covered in large glass picture panels which separate the back of house areas from the customer. Timber screens are introduced on both sides of the interior focusing the customer towards the back glass wall. 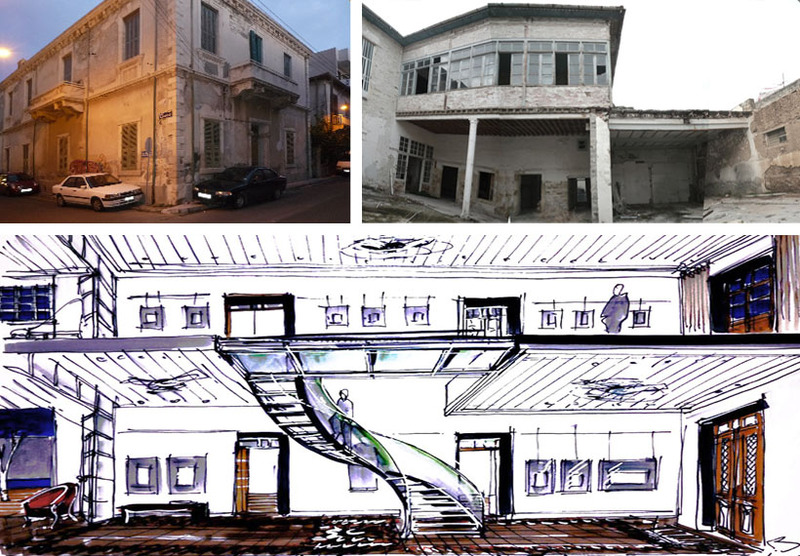 Vakis Associates is currently working on the sketch design stage for a private home located in the heart of the historic site of Amathus, Limassol. Early studies explore the envelope of the building designed as an eroded stone wall made from laser cut stone forms and taking reference from the surrounding archaeological site. Vakis Associates is working with a return client on the redesign of an existing Grade II Listed apartment located in Belgravia, Central London. During the early stages of the project, our office is working on the sketch design establishing the clients brief for the new interior layout and in parallel surveying the existing property. The studio has been appointed for the conversion and interior design of 2 existing mid 1970`s apartments into one large 4 bedroom property for a young family in Limassol. The building is located on the front line of the town, with the seafront behind it and enjoys spectacular panoramic sea views. The concept design is based on maximising the open plan living arrangement and extending the interior living areas towards the view by introducing a new cantilevered balcony structure. 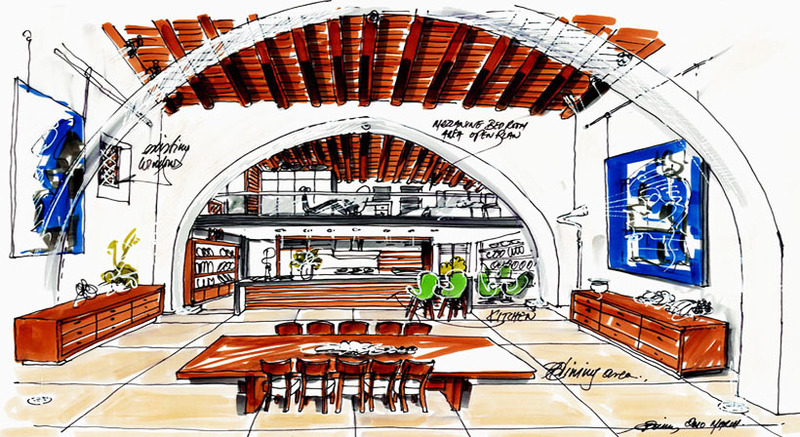 Vakis Associates studio has been appointed for the interior design of new whiskey lounge bar in Limassol. The design is based around an oval freestanding bar illuminated in the centre of the space and becoming a focal point and place to meet. Interior finishes and materials have been referenced from superyacht design combined with hidden lighting features and high laquered timber. 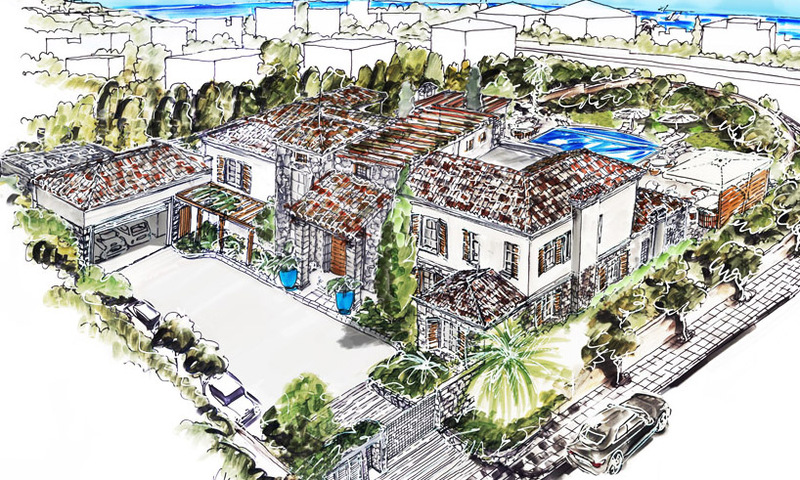 The studio has recently submitted the drawings for planning approvals for a private vila in Limasssol. The design is derived from the formalitites between the public and private spaces that the client wishes to enclose or otherwise open up towards the south facing sea view. This is reflected in the architectural language of the front street facade which is quite strict and formal, intoducing clean cut machined limestone with only a few openings which are set deep into the facade. Working with a site which has large differences in height, the form of the vila cascades introducing different levels with entertainment spaces, both indooor and outdootr, along the entire length of the plot. The studio has recently completed a 17 meter tall glass chandelier for a provate house in Montenegro. Extending across 4 storeys and consisting of 2500 glass blown pieces the final effect is to imitate a shoal of fish swimming around a coral reef and thus create a center piece feature for this family home. Recently completed in Montenegro is the design and installation of a custom made entrance door to an existing vila. 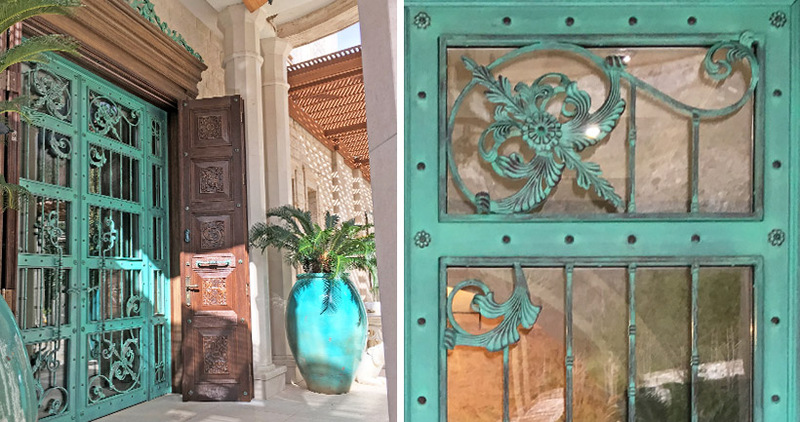 The door was manufactured in Cyprus by our local team of technicians and craftsmen and shipped for installation on site. Large glazed panels allow natural daylight to flood into the interior entrance foyer, while at the same time steel decorative features create a layer of secutiry from the exterior. In addition, two large wooden shutters fold back on to themselves and reveal the handrafted panels which reflect the zodiacs of the family members of the house. Breaking ground on site with the first stages of construction for a private family house located in the outskirts of Limassol. The main construction works have begun preparing the groundworks and forming the basement foundations. Vakis Associates has just completed a private vila located in the forest area on the outskirts of Nicosia. The design of the house is derived from the lack of external views, thus creating its own intenral courtyard view where the interior spaces blend seamlessly with the exterior pool garden area. Long concrete overhangs shade the internal areas and a series of cut outs in the slab allow partial light through creating a play of shadows across the length of the internal spaces. This recently completed 10 storey panoramic lift located in an existing 5 star resort in Pissouri is design to assist the circulation between the lobby reception areas and the cliff edge vilas located on the mountain above. 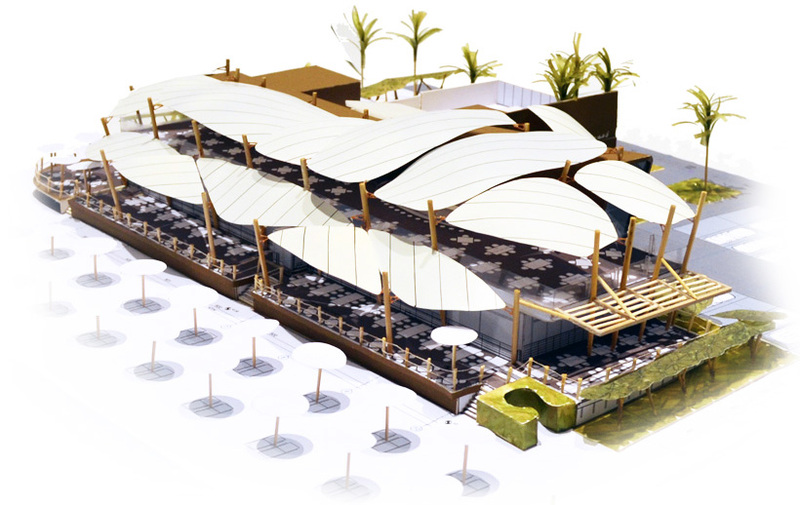 It is designed as a stand alone structure completely clad in 4 different shades of glass which relfect the surrounding stoned architecture and reducing the visual impact on the existing architecture of the resort. The steel lift structure is 15m tall and contains a large glass lift cabin with a capacity of 12 passengers. The entire stucture was prefabricated offsite and hoisted into the existing site. Vakis Associates studio has been appointed for the architectural and interior design of private residence for a young family located on hills overlooking Limassol Bay. The clients wishes were to live in a house with a romantic mediterranean feel with shaded outdoor spaces under pergolas. Taking that into consideration the design of the house is a classical mediterannean architecture strictly following the correct proportions and then carefully combining it with modern day interventions. This is reflected in the proportions of the open plan interior for the main entertainment spaces of the ground floor and creating smaller secondary ``building`` for the guesthouse an, parking area and assisting functions to the main house. An existing bar and restaurant in a 5 star resort has been transformed into an island open square, giving the space a light coloured introducing glass wine cellar features and yacht like interior decorations. Both the restaurant and the bar open up their interior space to a central dining terrace with a series of water features. 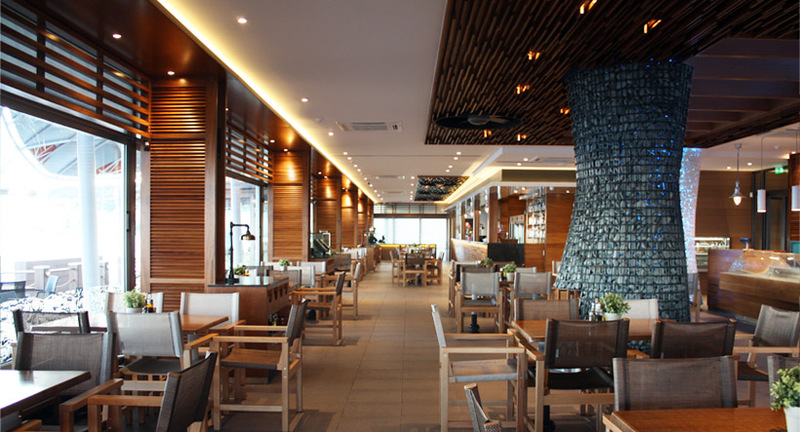 A new venue along beachfront of Limassol has been completed for Columbia Restaurants. Intoducing an all day , all year round restaurant and beach bar including a central courtyard pool with panoramic view of Limassol Bay. Apart from the buildings, all external areas have also been landscaped and designed to create a green oasis with large trees and secluded sand pit areas right on the edge of the sandy beach. The entire project was completed on a fast track programme in just under 7 months. Vakis Associates has been commissioned to design and install a chandelier for a private residence in Montenegro. The team has been working with lighting designers and glass blowers in the Czech Republic producing and refining samples of the glass elements and working on a mock up before the final stages. The finished product will have a total height of 17 metres consisting of approximately 3000 glass blown pieces to resemble a shoal of fish swimming around a coral spine. The site hoarding has been finally removed and cleared unveiling the new elevation of the Columbia Beach restaurant in Limassol. The North elevation is designed as a continuous screen of a mixture of ceramic tiles positioned vertically along the entire length of the site. The facade acts as sound barrier reflecting and absorbing the noise and bustle from the busy seaside road, allowing the customers to experience and focus on the sea view within the central pool courtyard. 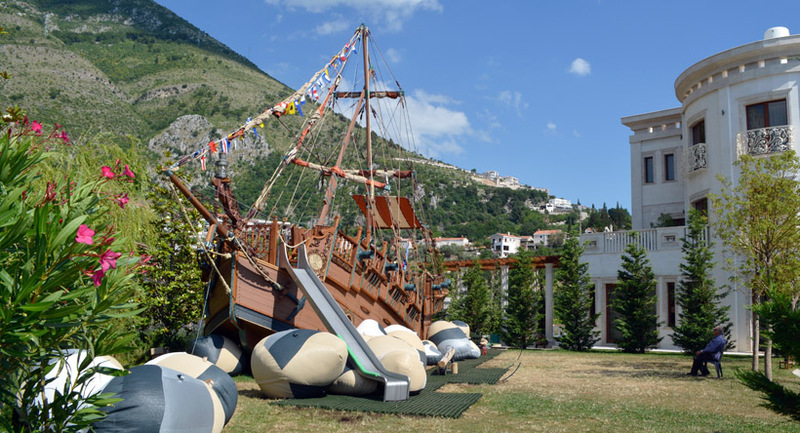 Vakis Associates studio has just completed the construction of a customised playship / playgound feature for a private vila in Montenegro. A team of 15 local craftsmen has been working in Cyprus on the makiing of the project for the past 2 months. Once completed the entrie structure was dismalntled and shipped via containers to the house in Montnenegro where it was installed in 14 days. Using locally sourced materials and craftmanship, the entire playship is tailored to be child friendly and also weather resistant addapting to the versatile climate conditions of Montenegro. Progress on site of a private family house located in the outskirts of Nicosia. The main construction works have all been completed and the forming of the external landscaped areas is well underway. The location and the wild natural landscape of Mosphiloti area has been introduced into the architecture of this private vila. A combination of local stone materials and smooth conrete walls. 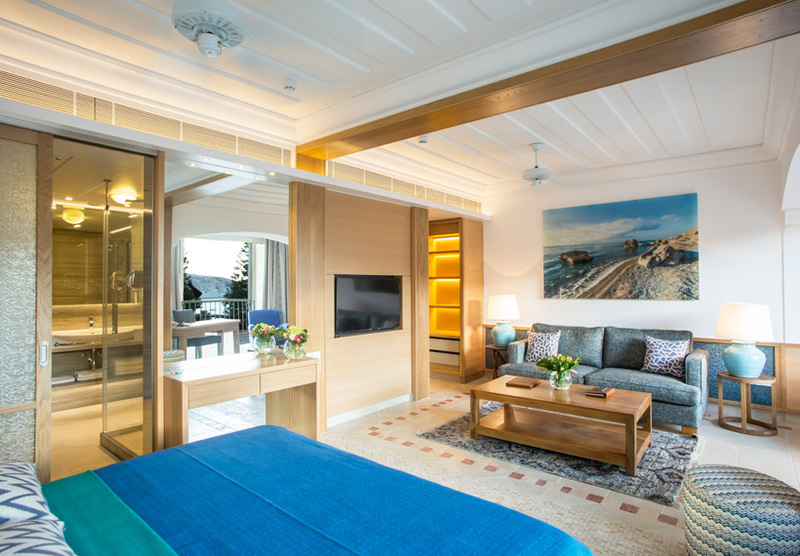 Vakis Associates studio has just completed the sample room suite for the upgrade of the existing Columbia Beach Hotel & Resort in Pissouri. All the main building guestrooms of the existing Hotel will be transformed into luxurious 60sq.m. suites and a selection 100sq.m. family suites all equipped with modern day inroom facilities and localy sourced materials for the interiors. Due for completion in August 2017. Vakis Associates studio has been appointed for the design and construction of a customised playship / playgound feature for a private vila in Montenegro. The entire structure is to be designed and detailed in Cyprus, using locally sourced materials and craftmanship, tailored to be child friendly and also weather resistant addapting to the climate conditions of Montenegro. It will be assembled in Cyprus fully, as a finished product, then dismantled and container shipped later this July to the vila in Montenegro where our team will complete the assembly and final finishes on site. 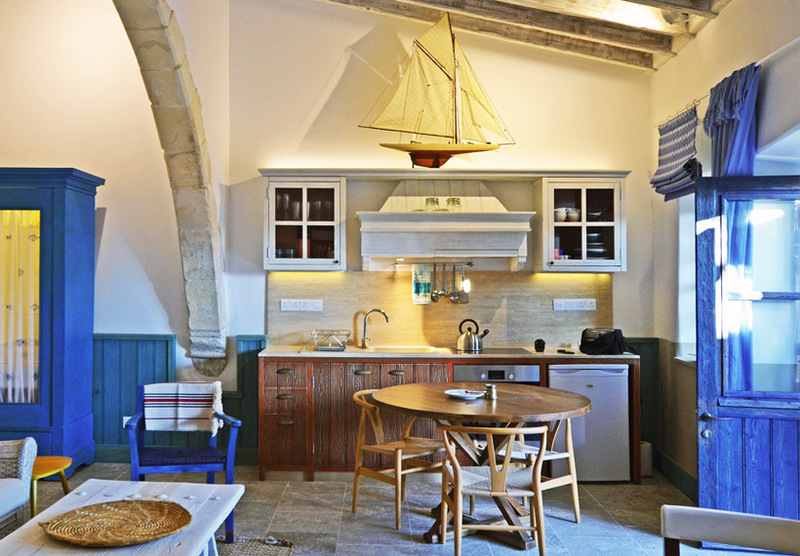 The interior design refurbishment of two listed properties in the village of Lofou has just been completed. These properties are part of the traditional Apokryfo guesthouses, a small listed country hotel that has been created out of a cluster of old stone buildings which have been extensively renovated to accommodate rooms, houses, a restaurant, spa, seminar room, wine cellar, outdoor pool and roof terrace. Vakis Associates studio has been appointed for the architectural and interior design for a new beach restaurant on the seafront of Limassol. The well established relationship with the client has helped create a unique concept for a new style of seaside entertainment. Lightweight timber pergolas and tensile fabric canopies create a play between shadows and daylight in the main pool courtyard of the restaurant. The external works on site at Vila Rezevici in Montenegro have been completed and delivered to the client. 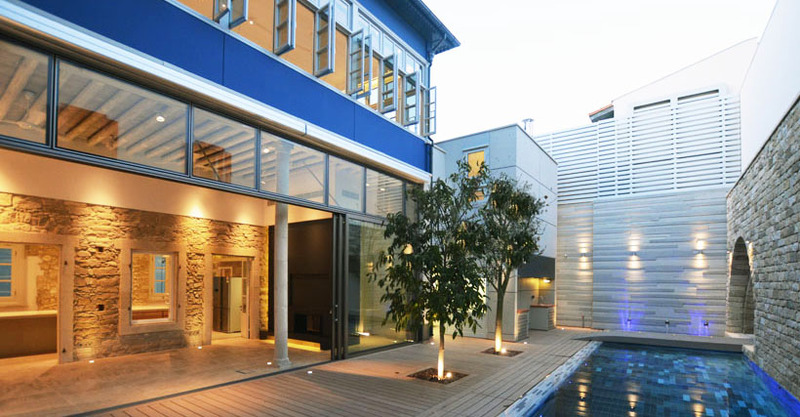 Phase 2 of the project involved the constuction of a steel Orangerie pavilion, a 54 metre long Arcade garden pergola and a series of timber pergolas around different areas of the existing vila to soften the architecture of the building. All the structures were carefully surveyed and measured off site, manufactured, constructed and detailed in Cyprus and shipped to Montenegro where the final assembly took place. 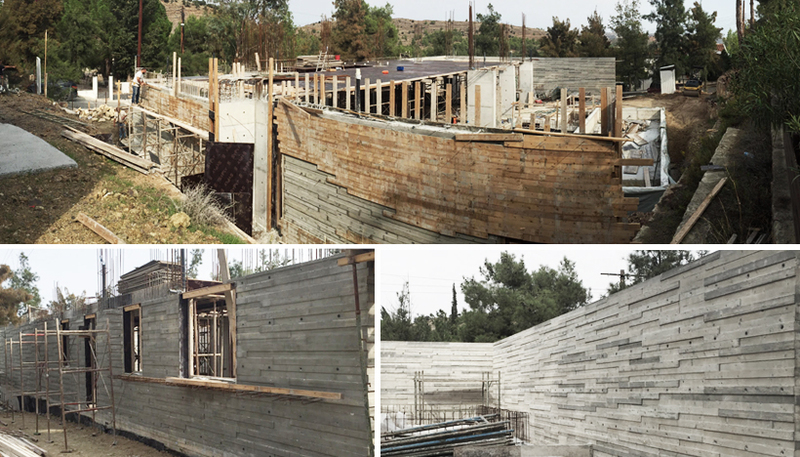 Progress on site of a private family house located in the outskirts of Nicosia. The concrete works have been completed for the entire house and the project program of the interiors finishings is well underway. Vakis Associates studio has been appointed for the architectural and interior design of private residence for a young family recently moved to the island. The plot location is in between two green valleys in the coastal town of Limassol, boosting panoramic views across the entire bay. As a staring point the plan and orientation of the house sits on the plot harnessing the views both to East and West and creating a semi enclosed courtyard-like garden space where the pool and outdoor entertainment areas are located. The architectural language adopts a romantic Italian inspired form with a central building and outbuildings for the secondary living areas rotated around an octagonal rotunda. The design studio has just completed an apartment conversion in an existing garage space of a luxury vila in Pissouri. The main challenge was to create a luxurious two bed apartment, fully equipped with kitchen, dining and living areas in an existing space with minimal daylight. The concept is that both bedrooms are open plan towards the living areas, introducing hand crafted sliding screens with translucent patterned glass to allow as much daylight into the depth of the space and at the same time privacy. The use of wallpaper and light timber paneling has transformed the existing garage space into a family home. Vakis Associates studio is proud to have received the award for A` Architecture, Building and Structure Design Award for the project Art Collector`s House in Pyrga. The design and concept of this house was inspired by the surrounding landscape and topography of the dense forest area of Stavrovouni and the challenge of combining two briefs, a home and an art gallery (with an extensive varied collection). The clients vast collection of art work almost became the main inhabitant for the interior design of the house and gallery. Framing the surrounding raw nature and exposing panoramic views to the outside were key to design and especially the orientation of the house. The studio is currently working on the revamp and refurb of an existing restaurant and bar for the Columbia Resort in Pissouri, creating a new concept of an island fishing village open-air atmosphere. The combination of timber paneling and cladding, whitewashed furniture and vibrant soft furnihshings creates the rustic feel required. Progress of the works on site at Vila Rezevici in Montenegro is well underway and powering through the tough weather conditions. 5 fourty foot containters have been unloaded on site and assembly of the Orangerie pavilion and Arcade garden pergola are moving ahead according to program. The 42 lasercut steel arches are in position and ready to accept the timber cladding in order to form the new pergola which sits as a backdrop to the Vila. Additional works to the house include a series of timber and stone pergolas around the exterior to soften the architecture of the building. The project for a large family Vila is progressing through to the tender stages and soon to be mobilised on site in the coming months. The practice has been looking at the material pallete and finishes for the vila, using locally sourced stone and designed landscaped areas in order to meet the client`s needs. Progress on site with of a private family house located in the outskirts of Nicosia. The building design aims to utilise the existing terain to create a terraced architecture with long overhangs creating natural shading and framed views towards the green surrounding landscape. Concrete works for the basement level and ground floor have just been completed according to the constuction program. 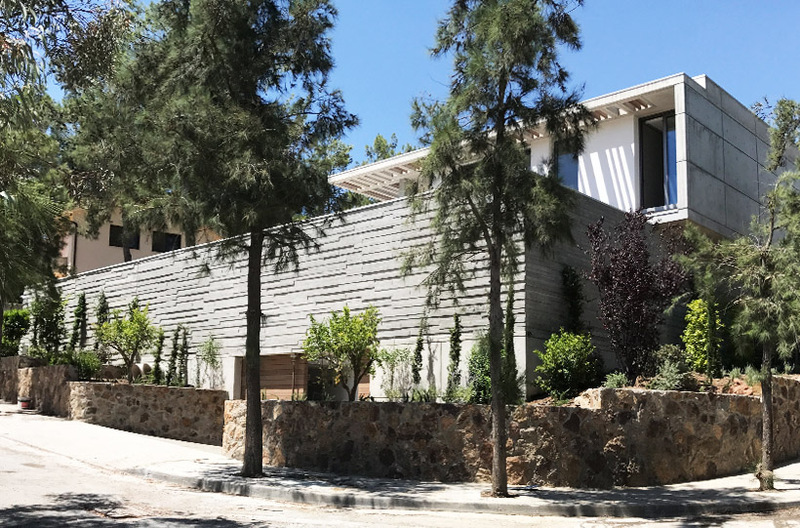 A 3 dimensional wood shuttered concrete technique has been applied in this house which has proved to good results and a new aesthetic approach to using concrete. Progress on the works on site for the interior of a new apartment in Pissouri Bay are nearing completion. The existing 100 sqm. car parking space has been converted into a luxury duplex 2 bed apartment. Working with lightweight steel structures and soft interior finshes such as wallpaper clad panels, the space is being converted into a Japanese style home. Part of our design approach is to offer in our services a fully integrated interior design from all aspects, including the design and detailing of all kitchen areas. Each project tailored differently to suit the desires and needs of the client, wether it be a private house for a family or a full blown commercial kitchen to cater for restaurants and 5 star hotels. Working with a team of specialised local craftsmen we can explore new ways of construction and materials in order to fine detail these interior spaces. The construction work for the first of two listed buildings has just been completed, located in the heart of the old town of Limassol. The design of the house was mainly based on restoring and conserving as much of the original character of the building with the subtle intorduction of modern interventions for the modern family. The living spaces are arranged around a central courtyard which incorporates a swimming pool and an open living room terrace. 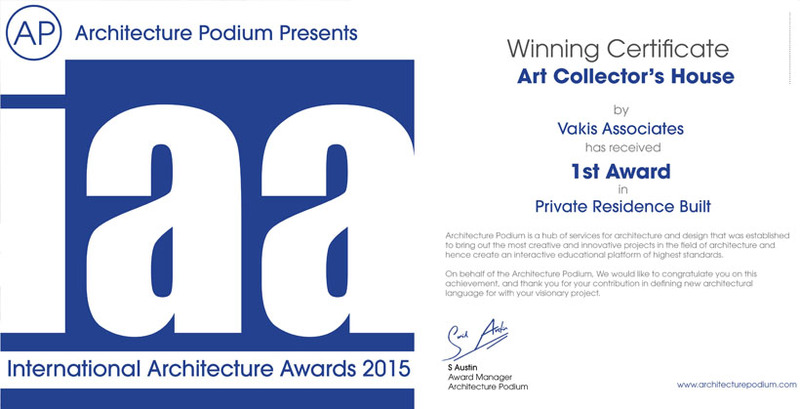 Vakis Associates studio is proud to have received the award for 1st place for Private Built Residences for the Architecture Podium Awards 2015 for the project Art Collector`s House in Pyrga. The works on site for the two new pavilions for a gym area and billiard room are in the finishing stages. Each pavilion is constructed from lightweight steel structure which is coverered and weatherproofed by a custom PVC tensile fabric material. Interior fit outs are under way setting a contemporary safari mood throughout for the billiard room by Thesis Interior Design Showrooms. The practice has been working on designing and creating prefabricated fully enclosed pavilions both for the addition to existing buildings and new builds. Following a detailed survey, the pavilion is first manufactured and assembled off site in a warehouse space which mirrors the on site parameters. All components are prefabricated, designed and detailed to a high level so that the assembly is as quick as possible. Once this process is completed, all parts are packed into a 20ft container were they are then transported / shipped to the on site location. This sustainable approach minimises the construction time spent on site speeding up the final delivery. Vakis Associates studio has just completed the design of Chris Blue Beach Restaurant located on Curium beach on the West coast of Limassol. 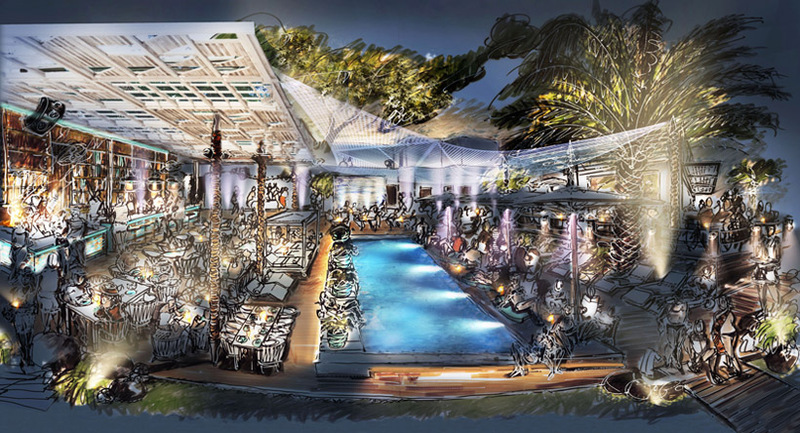 The 900m² project is a complete renovation of an existing restaurant, transformed into a luxury seaside location. 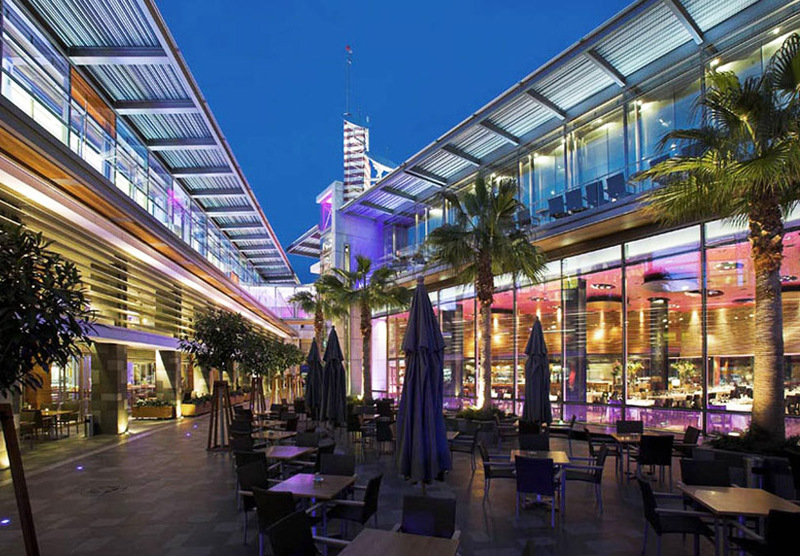 Designed in response to the local weather conditions, the new restraurant introduces bespoke designed canopies which take advantage of the sun and waterfront site, creating cool and shaded dining environments both during the day and at night. The interior architecture is a celebration of sailing - combining irokko timber craftmanship and fine stainless steel detailing. 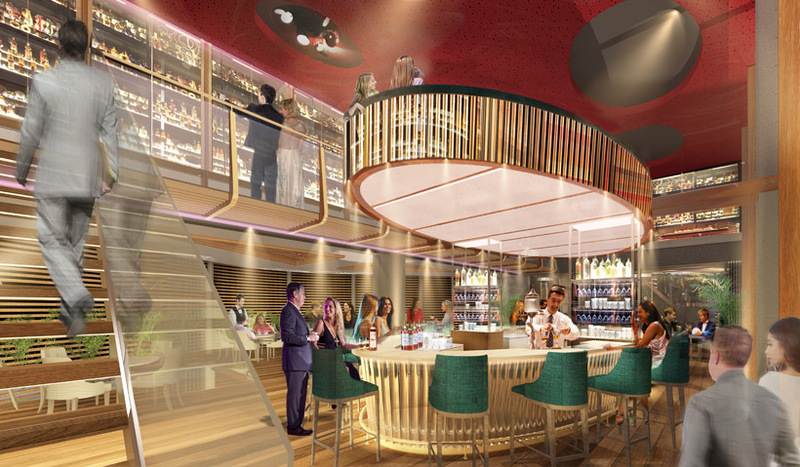 The design of the ground floor restaurant is such that it enables the future proposed expansion, introducing a first floor sun deck which will feature an additional dining area to offer unrivalled views out to the sea. 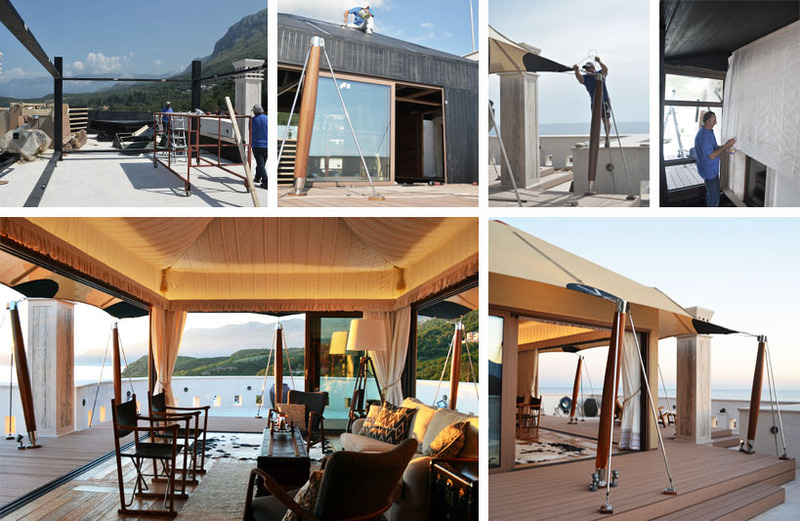 The studio is currently wokring on the Phase 2 works for the Villa Rezevici in Montenegro. The design of a new summerhouse in the style of an orangerie and the insertion of a steel pergola which runs along the landscaped terraces of the site. We have also been working with local steel workers on lasercut mockups and model studies for the structure of the pergolas. Other works include the extension of the villas main entrance and external terraced areas to create an architectural language which ties the whole project together. The works on Phase 2 for the Seaside Vila in Peyia, Paphos, have started on site. These include the design and construction of 2 pavilions, a gym space and an entertainment/bar area, which overlook the main pool and offer panoramic views to the sea. Each pavilion is constructued from a lightweight steel structure which is coverered and weatherproofed by custom PVC tensile fabric material. 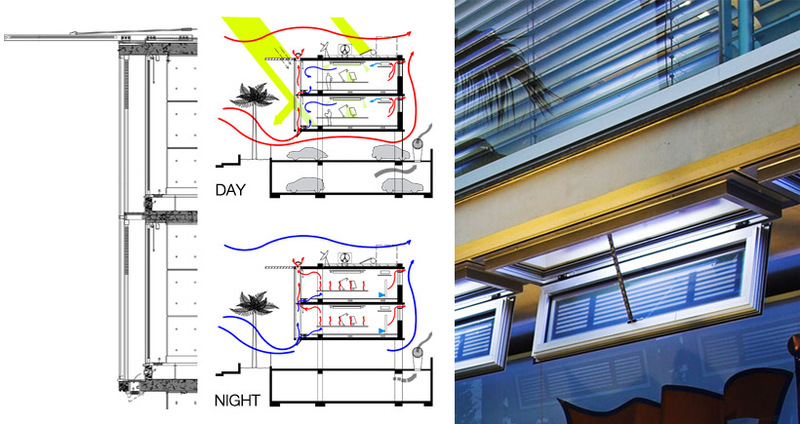 The double skin facade used in this building consists of two skins of double glazing with a 60cm cavity between, placed in such a way to allow fresh air to circulate within the building for cooling and heating accordingly. In this case, it is a hybrid system which is supported by mechanical underfloor fans that circulate the fresh air throughout the office space. Long overhangs and reflective coated glazing minimise the solar glare throughout the peak summer months and the entire building is managed by a software system that regulates the flow of air through the cavity, the angle of the shading louvres and heating /cooling of the interior according to the climatic conditions. All this results a substantial lower energy consumption and the formula of this design can be adopted to other types of buildings, residential flats, private homes etc. The works on site for the renovation of a traditional fish restaurant are well underway as the start of the summer season approaches. Custom made steel enclosures design by Vakis Associates have been manufactured locally and installed on site around the existing structure filled with smooth pebbles reminiscing to the existing site conditions at Curium Beach. The new timber feature ceiling is currently near completion transfroming the dining space into a more intimate environment by acting as a sound insulator to deal with the large open plan area. Vakis Associates has been appointed for the design of a new apartment and rooftop gym area in an existing building located in Pissouri Bay, Limassol. The studio is currently working on architectural proposals inspired by japanese interiors exploring the use of light handcrafted panels and translucent materials and fabrics. Site preparation is currently under way for the breaking ground of a private 800 sqm. villa, located in the Mosphiloti area of Nicosia. The building aims to utilise the existing terain to create a terraced architecture with long overhangs creating natural shading and framed views towards the green surrounding landscape. Locally sourced rough cut stone creates a base where the main entertainment spaces are located, supporting the lightweight concrete structure above which accommodates the bedrooms. Victor Hadjikyriacou recently joined the practice after studying and working abroad in London. Having graduated from the Bartlet School of Architecture and working at Foster + Partners on a variety of projects from high rise residential to mixed used international developments, he has joined the practice as a design partner. 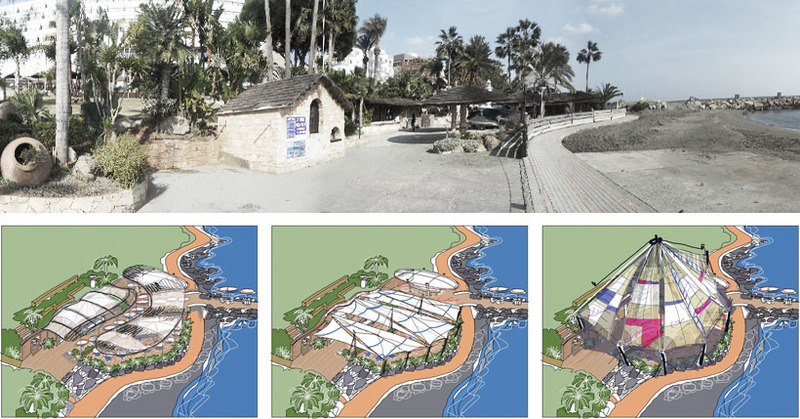 Vakis Associates has been appointed for the complete renovation of an existing beach restaurant and proposals for the future expansion phases, located in the West coast of Limassol in Curium Bay. The proposals look at ways of creating comfortable dining environments both indoors and outdoors in order for the business to run throughout all four seasons. Material research into new inovative materials such as high quality PVC fabrics and other building materials to withstand the adverse weather conditions of the area. Construction work on site for a private listed house located in Limassol Old Town is due for completion in the coming months. The final external works are currently taking place restoring and conserving as much of the original character of the building with the subtle intorduction of modern interventions. 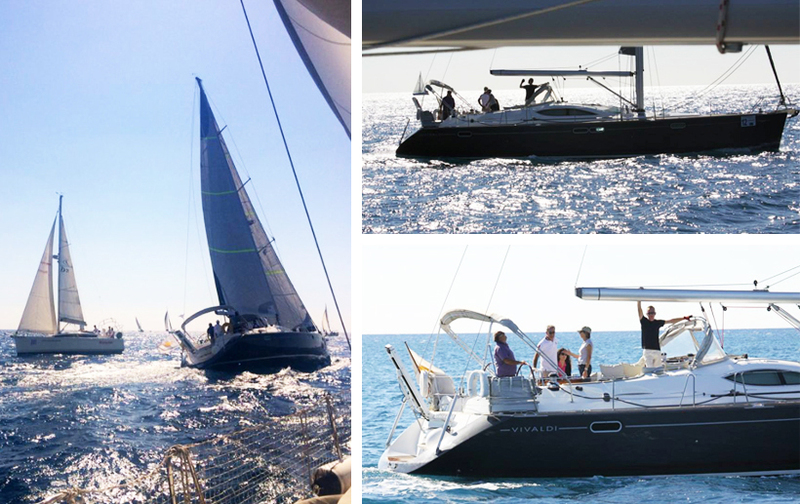 Vakis Associates studio is happy to announce its 3rd place award for the Ioannidea 2014 Offshore Race held in Limassol bay over the weekend, competing with over 30 yachts from across the island. Part of our work produced in the practice is inspired by marine interiors and technical details developed onboard yachts. Following the completion of the Apokryfo traditional boutique hotel, after the 4th year of its opening the establishment has been presented with the Trip Advisor awards for "Certificate of Excelence 2014" and "Travelers` Choice 2015". Vakis Associates, in collaboration with Thesis Interior Design Showrooms has completed the Phase 1 of the full refurbishment of both the exterior landscape works and interior design of a newly built villa, located on the Adriatic coast of Montenegro. 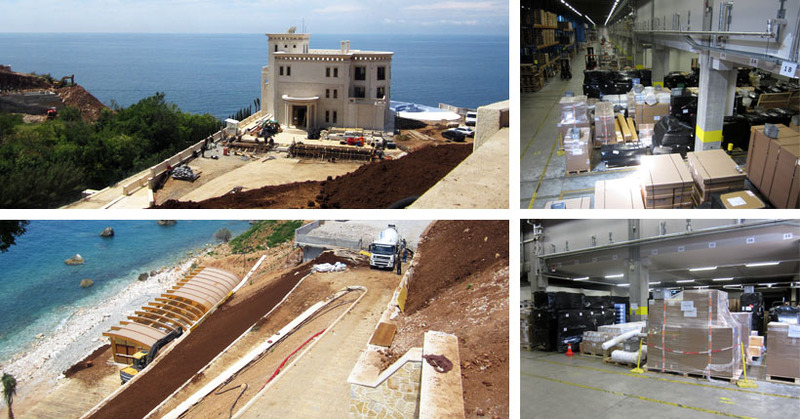 The overall project took 6 months to complete from start to to finish, setting up a workflow with an efficient design team from manufacturing off site in Cyprus, to delivering and finalising on site in Montenegro. Phase 2 of the project is currently under study, involving further external landscaping works with the insertion of pavilions and a new guest house. Vakis Associates has just completed a house, designed to enjoy the panoramic sea view from every corner of its plan. Terraced areas and deep overhangs respond to the challenging terrain of the site and at the same time maximising the shaded outdoor space. Construction work on site at Vila Rezevici is well underway, all goods, furniture, kitchens, interior fittings, and outdoor pavilion structures have been constructed and manufactured off site and shipped to the location where they are currently being assembled by a team of specialists set up by Vakis Associates and Thesis Interior Design Showrooms. Due for completion in the coming month. Vakis Associates has just completed a house for an art collector and his family. The residence is designed to respond to the surrounding woodland area creating a panoramic gallery, housing a vast collection of artwork, in the middle of the pine forest of Pyrga. Vakis Associates has just completed the design of a traditional seafood restaurant along the Limassol waterfront for the Amathus Beach Hotel. The space is created around a fetaure wall which runs along the lenth of the site adjacent to the sea, housing the all the back of house spaces such as kitchens, store rooms, toilets. Thus creating an open plan dining area which is covered by bespoke tensile PVC fabric canopies, immitating the forms of sails on a yacht and creating a cool sheltered environment during the summer months. Vakis Associates has been published in the "Urban Complex II" Architectural Magazine for the completion of the Columbia Plaza masterplan in Limassol. Vakis Associates has been appointed for the complete renovation and additional design components of an existing private villa located in Montenegro. Due for completion in July 2014. 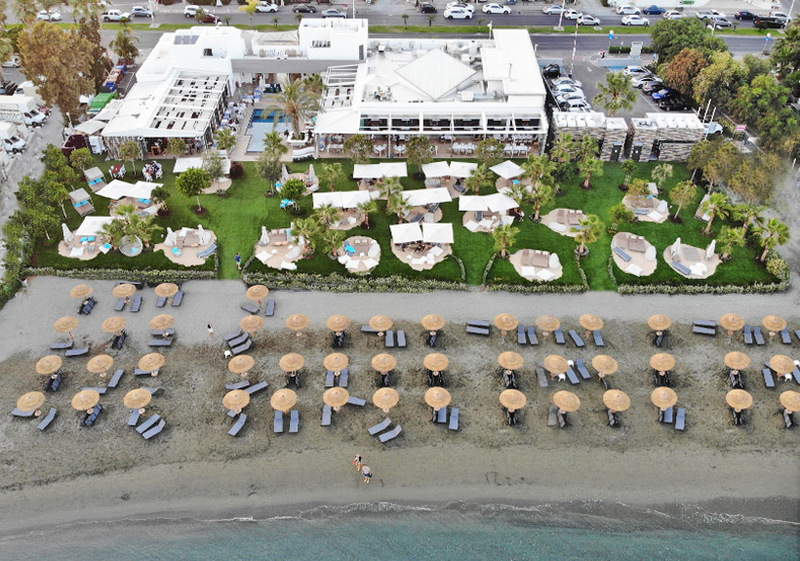 Vakis Associates has been appointed for the full renovation of a traditional seafood restaurant for the Amathus Hotel, in Limassol. The 900m² site extends along the public promenade and offers panormaic views to the sea. In order to be ready for the upcoming summer season, the project will run on tight schedule with many of work prefabricated off site. Due for completion in May 2014. Vakis Associates in collaboration with Thesis Interior Design Showrooms has just completed a full renovation of an existing seaside villa along the West coast of Cyprus in the region of Pegia. Vakis Associates has been shortlisted for the design of a 15,000m² Hotel Resort located on natural peninsula in the West coast of Cyprus. The submission proposed a masterplan of uses, ranging from retail units, cafes and restaurants, a main hotel with 200+ keys, spa and leisure facilites, a public seafront walkway, private serviced villas and provision for a small marina. Vakis Associates is happy to annouce that the practice has been awarded by the Limassol Munincipality for the project of Columbia Plaza as part of the regeneration strategy of Limassol Old Town. Tenders to the contractors have just been submitted for a private residential villa located on the outskirts of Limassol. 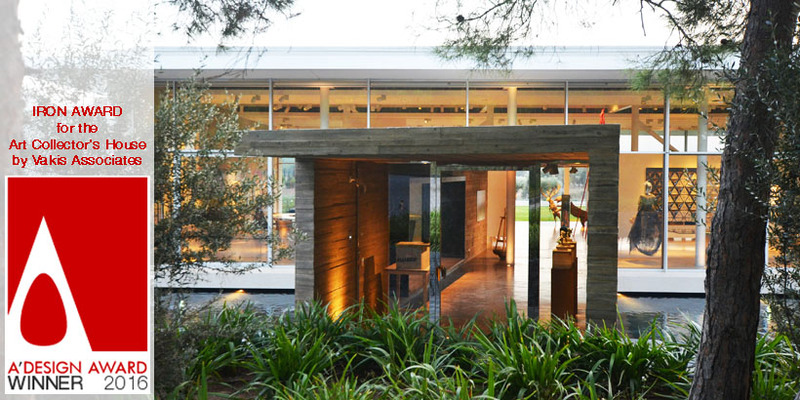 Vakis Associates has just completed a private residential villa on the outskirts of Nicosia. The combination of the heavy stone base and the continuous glazing makes the curved concrete structure on the first floor appear to be floating. The elevated site has unobstructed views to the Pentedaktylos mountains during the day and the lights of Nicosia town at night. We are happy to annouce that the practice has been awarded an Honourable Mention for the competition entry for the new Biological Sciences Campus in Nicosia. Submitted earlier in the year, the proposal is was based on an elevated campus building to house the laboratories for the Biological Department of the Cyprus University. At grade level the landscape extends across the entire footprint of the site creating pockets of spaces at grade level for lecture rooms, cafeterias and circulation spaces. 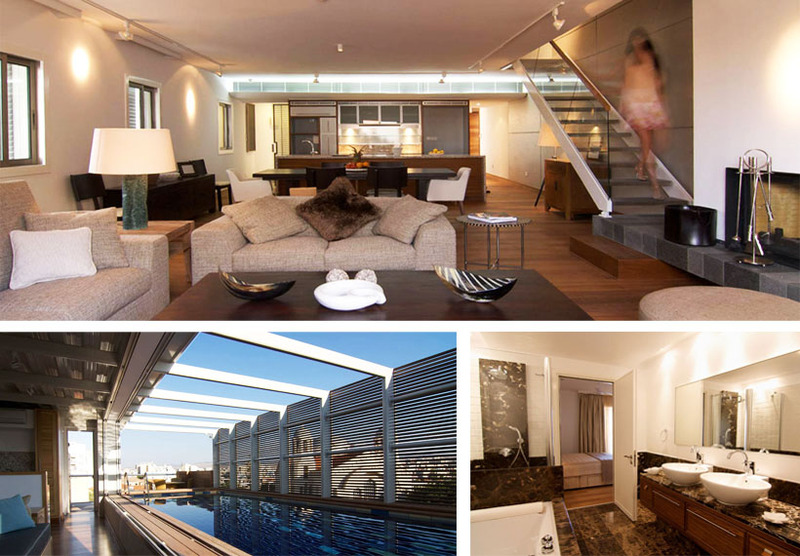 Vakis Associates has just completed a 2 storey luxury penthouse apartment overlooking Limassol Bay. Inspired by marine interior desing, all the finishes and detailing reflect a similar ambience and luxury to that in superyachts. Vakis Associates has just completed a retail complex located on the high street of Limassol Old Town. The mixed used building extends over 4 floors, offering doubleheight retail units on street level and flexi office units on the upper levels. Vakis Associates has been published in the Domes Architectural Magazine for the completion of the Columbia Plaza masterplan in Limassol. Construction work on site for a private villa located in the outskirts of Nicosia is well underway and due for completion at the beginning of 2013. Located in a dense neighborhood, the architectural proposal was to elevate the living spaces from the street level and with the use of cantelevering slabs, create intimate entertainment spaces at grade level. The practice has been commisioned for the full renovation and conversion of 2 apartments into one luxury penthouse apartment overlooking the Limassol Bay. The clients love for yachts is used as the concept for the design of panoramic open plan living spaces with marine like detailed features. Due for completion later this year. 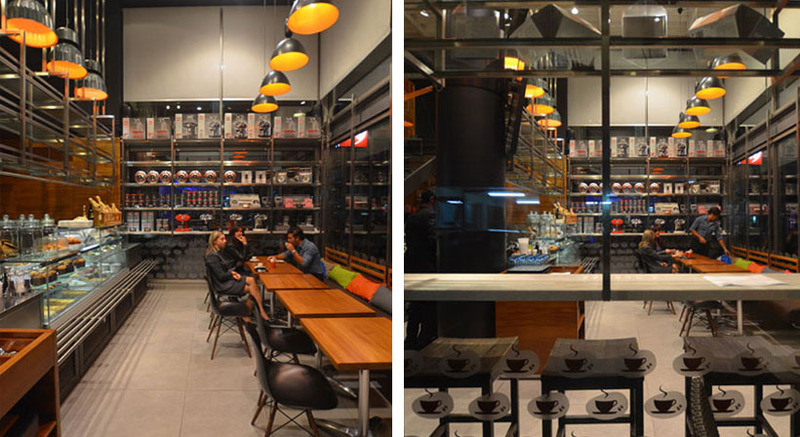 Vakis Associates has just completed a new esspresso cafe locatred in the Columbia Plaza in Limassol town centre. A listed house conversion has just broken ground on site this month with contractors Depcon Construction Ltd. on board. 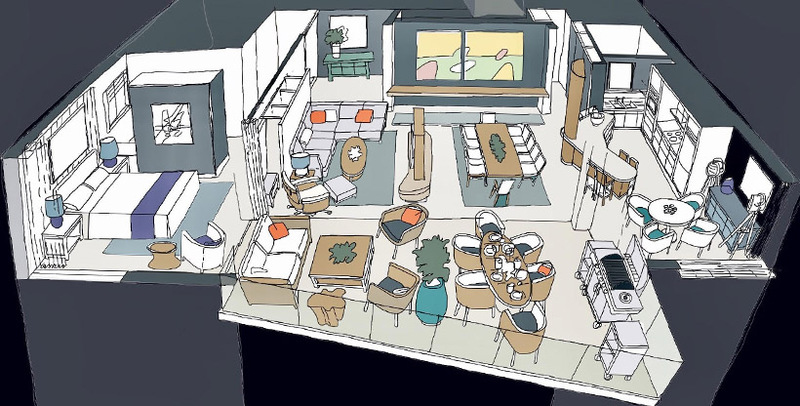 The proposal is the restoration of a an old building, located in the heart of Limassol old town, into a modern family home and the inclusion of a workspace. 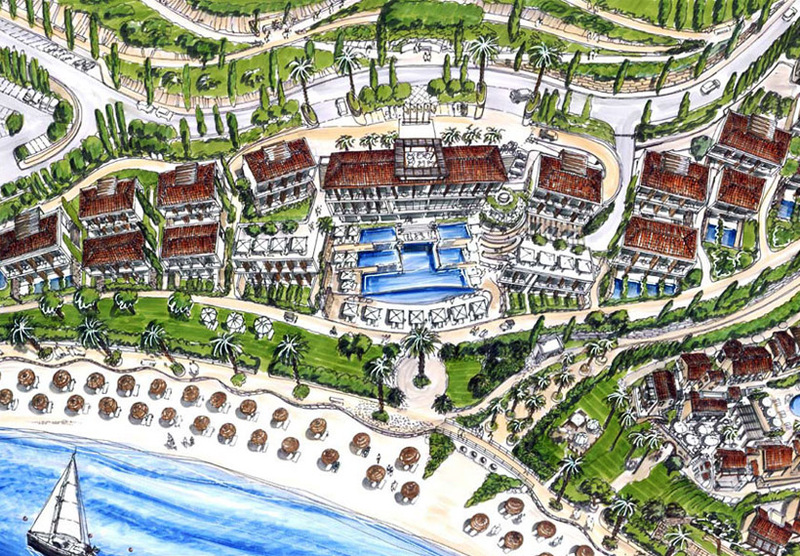 Our office has recently been commissioned by the Columbia Hotel group to draw up proposals for a 5* business retreat hotel in the bay of Pissouri with a brief for 250 keys, including conference centres, pool, spa and gym facilites. The site is located adjacent to the existing Columbia Resort and extends along the coastline offering panoramic sea views and shelter from the strong summer prevailing winds. The practice has recently been commissioned to restore a 2 listed buildings into a family house, located in the Limassol Old Town. Initial structural works have started on site, strengthening and reinforcing the existing buildings with the aim to preserve as much of the original architectural state as possible. The contemporary transformation will have all living spaces on the ground floor with a central courtyard, creating a secluded swimming pool and sun terraced area in the heart of the home. Our office is participating in the Cyprus exhibition, "Encounters: a walking movie" at the Venice Biennale. Vakis Asscoaites, in collaboration with the Thesis Interior Design Showrooms has just fitted out 12 luxury apartments located in the Columbia Plaza in the centre of Limassol Town. All units have been fitted out with bespoke kitchens and handctrafted furniture desinged by the interior design team of Thesis. 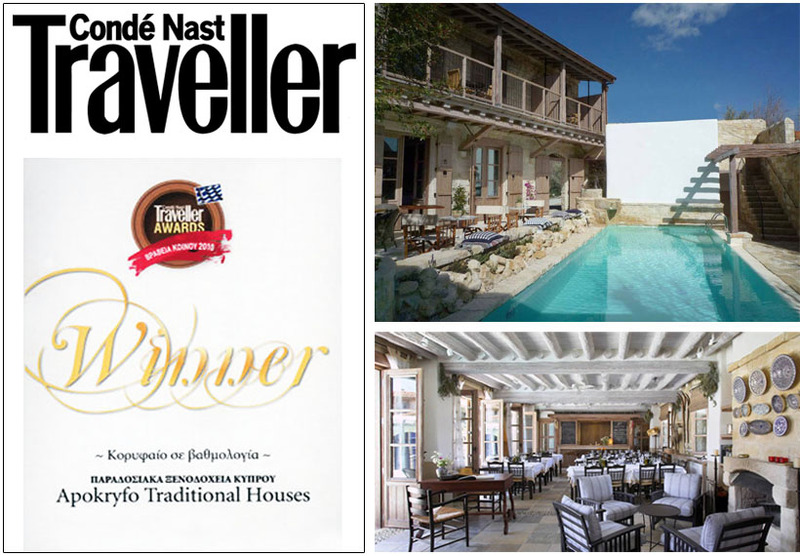 Following the completion of the Apokryfo traditional boutique hotel, after the second year of its opening the establishment has been presented with the Conde Nast Traveller Award for the Best Traditional Hotel of 2010. The hotel is located in the village of Lofou, and is desinged as a collection of small listed houses surrounding a central building which houses the restaurant, spa and pool area. Vakis Associates have worked within the regualtions of the Conservation Area to create a contemporary architecture to satisfy the hospitality needs of the hotel operator. The practice has submitted proposals for the Cyprus News Agency Headquarters in Nicosia. The desing team has been investigating the structure of todays news agency`s from around the world to create a building which can efficiently respond to the high demand of the agency and its 24hour operation. Lightweight steal structures and double skinned envelopes aim to repsond to the climate of the surrounding area but also to visually inform the public throguh the use of projection screens on the facade. 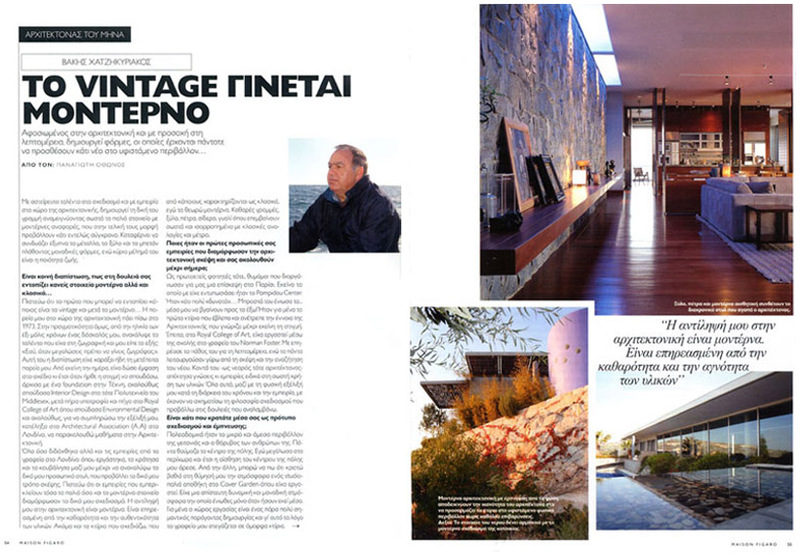 Following the completion of projects such as the Columbia Plaza and the Pissouri Beach Resort, Vakis Hadjikyriacou has been interviewed to discuss about his approach towards architecture. Vakis Associates has just completed the masteprlan for the Columbia Plaza mixed use building located in the heart of Limassol old town. Among our office practices to generate new work is the ability to discover abandoned buildings and places with significant values and to offer prospective investors and close collaborators the chance to suggest ideas for their refurbishment and reuse. As a result, for the restoration of the specific building complex, we contacted the German company Columbia Hotels & Resorts based in Limassol, which were constantly looking for remarkable places within the city centre in order to expand their services in gastronomy, hospitality and entertainment. At a public hearing in Limassol, the Mayor and the council together with 4 ministers: Mr Neoklis Sylikiotis, Minister of Interior, Mrs Erato Kozakou Marcoullis, Minister for Communications and Works, Mr Demetris Eliades Minister of Agriculture, Natural Resources and Environment and Mr. Antonis Paschalides, Minister for Commerce and Industry gave their unanimous support to the Island project. The Tepak University and the Cyprus University showed a strong interest in helping and participating in the running of the marine institute. Media and public were present and the positive support for the project was televised and published. We are delighted that our efforts in creating projects that encourage public use and environmental awareness are widely and enthusiastically accepted.